The following was written five days after the jury in the Mark Duggan inquest returned a conclusion that Duggan was lawfully killed by the Metropolitan Police despite being unarmed. It reviews the response in the media – there is more to say on that topic alone – but anger precludes more writing around the issue. Since writing this a petition has sprung up to have journalist Richard Littlejohn removed from his job for a vicious attack he write against Mark’s aunt Carol. The campaign has continued to be maligned, but support for the family and for justice remain strong. There is and will be more to say, but for now, just this: no justice, no peace! I am still so angry. So very angry I feel ill. Mark Duggan was according to his inquest jury, lawfully killed despite in their conclusion not being armed. There is so much to say but much has already been written about the anomalies so this will be some observations on the public and media response. 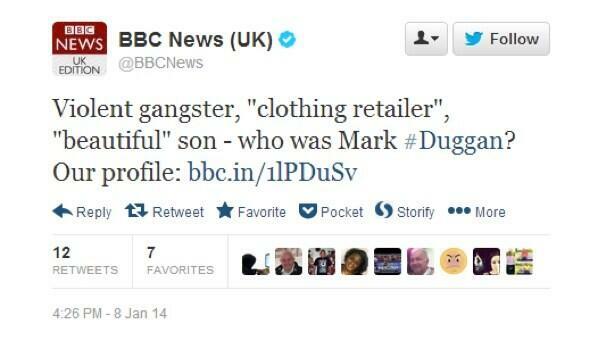 You would think that, knowing the conclusions from the jury were due at 3.30 on 8January 2014, that researchers or presenters or journalists at the BBC News 24 channel, clearly not having bothered in the previous two and half years, would have at least on the day familiarised themselves with the names and appearances of Duggan family members and supporters. This would include their lawyer Marcia Willis Stewart whose name they had and who they expected to give a statement from the steps of the Royal Courts of Justice imminently once they conclusions had been heard. Yet when Willis Stewart and members of the Duggan family did come out of the court to speak what followed from the BBC newsroom was a pathetic example of the racism, dehumanisation and heedlessness that results in police forces killing unarmed black men. Willis Stewart was the first to speak. The newsroom after she finished reported along the lines of, “We just had a statement we are not sure who from, by a lady on the steps.” You cannot help but wonder whether the fact they could not believe the articulate, intelligent woman was in fact the family’s lawyer stemmed from the fact that she was black.Then came the comments from ‘a man on the steps’ stating that the family would not hide, the perpetrators of Duggan’s killing should hide as the family would continue fighting to expose them. Later, much later, the newsroom identified him as Mark Duggan’s brother Sean Duggan (actually his name is Sean Hall). Finally, Carol Duggan’s inspirational speech culminating in her cry, “No justice, no peace,” was attributed to Pamela Duggan, Mark’s mother. In some ways this was the worst misattribution as Carol Duggan, Mark’s aunt has been the face of the family campaign since the killing in 2011. Whilst all were clarified later, there really were no excuses for the lack of preparedness. None. Whilst driving soon after the conclusions, I could only find one radio channel talking about the case. It was a call in channel and the gist of the calls I caught was, “Live by the gun, die by the gun,” referring to the spurious allegation that Mark Duggan was a violent gang member, something strenuously denied by his family. It was a trope used from the time of his killing that would take off again in the days to come. Still Neill carried on in this vein joined in his journey into vilification by Giles Fraser erstwhile canon chancellor of St Paul’s Cathedral and a Guardian columnist and all over bastion of white goodness. He began his analysis of the previous day’s events stating repeatedly how intimidated he was by Carol.Duggan’s speech, declaring that her ending remark was in his mind a call to violence. This was several hours after Carol Duggan had made clear that the family did not want violent demonstrations and that their continued campaign was to be a peaceful one. It was not a statement that needed to be made given that the campaign had always been peaceful and that it had decried the excesses of violence where there were any during the 2011 riots when carried out in Mark’s name. Yet the ‘fear’ of the Giles Fraser set, sought and got this statement from her and yet it still wasn’t enough. Fraser sought to imply a level of stupidity on the part of the campaign by pitching to Tottenham MP David Lammy that the call for a vigil outside the police station for the coming Saturday was incorrect because that would hardly be a vigil in the proper sense, more a demonstration. It is a sad day when the most reasonable person in a discussion is David Lammy. “That’s a good point,” he responded to Fraser before going on to explain that the fact was that in Tottenham there is a very real history of police killings four in four decades: Cynthia Jarret, Joy Gardner, Roger Sylvester and Mark Duggan. There is a reason why it is a vigil. The people of Tottenham know it. There was in all this a ray of hope.. A thread on mumsnet appeared to be overwhelmingly appalled by the conclusion. Explanations included the idea that the jury knew they would be under intense pressure if they it to be an unlawful killing. There was also an acknowledgment that as white Middle class women they were unlikely to be gunned down by the police but nevertheless they could see corruption. When I tuned in to the news on Friday morning I was amazed and thought this realisation had miraculously seeped into the media mainstream as presenters spoke about the crisis in policing, the biggest scandal in modern police history and all the changes that had to be made. However this was not about the killing of an unarmed black man.. That was still ok. This was about the lies told about a white man, soon most likely to be reinstated to the ministerial position he had to resign because of the police’s false accusations, his reputation now restored, his nightmare over. Heads will roll, prosecutions will be brought and institutional change enforced. The police are not a behemoth that cannot be brought to task. The fact that were not over Duggan’s killing – and that media, political and social discourse cannot understand or explain why this is bad – speaks volumes to the state of the state we live in today. Arzu Merali is one of the founders of IHRC. Follow her on Twitter @arzumerali.